The Genres: Portraiture Featuring Hope Gangloff, on view at the Eli and Edythe Broad Art Museum. 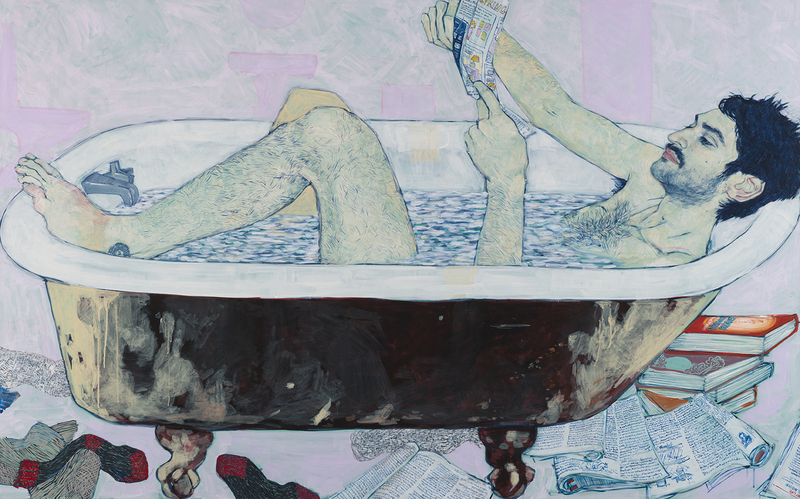 Twelve figurative paintings by Hope Gangloff are the focus of the exhibition, The Genres: Portraiture Featuring Hope Gangloff, at the Eli and Edythe Broad Art Museum in Lansing. Gangloff has had some recognition for her portraits of hipster-types, and considering that she’s just forty, it’s probable that you’ll see her work again, but the manner in which her paintings are displayed at the Broad Art Museum is unique. Curated by Alison Gass, Portraiture Featuring Hope Gangloff, is the first of three “Genre Series” exhibitions that showcase works from the “former” Kresge Art Museum. It might seem that the exhibition series is a conciliatory act, organized to assure skeptics that the Kresge collection will not forever languish in storage. While it’s true that the Kresge contributions function like props in an installation, the exhibit is nonetheless refreshing and clever. As if it was not evident to the viewer, the didactics indicate that Gangloff’s portraits are informed by the work of Gustav Klimt, Egon Schiele, Pierre Bonnard and Vincent van Gogh. I am going to take exception of the latter, and add Henri Matisse, Henri de Toulouse Lautrec and Alice Neel to the early modern mélange. 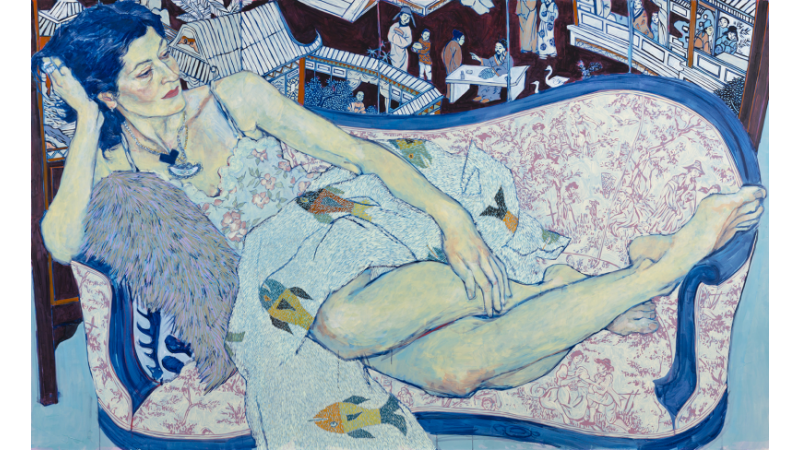 Van Gogh’s paintings are too ardent in tone and execution to be compared to Gangloff’s impassive subjects and understated brushwork. The paintings are colorful, but while there is a surprising amount of color used to describe the flesh of her subjects, everyone appears ashen or bruised, similar to Egon Schiele’s figures. Her meticulously described pattern, is reminiscent Gustav Klimt’s portrait subjects, binding the figures to their surroundings, and emphasizing their remoteness, like butterflies pinned under glass. The exhibition space suggests a turn of the century bohemian apartment with a few shabby antique furnishings placed in the center of the gallery, and the artwork arranged salon-style. Hanging art in closely arranged groupings was common in museums and private residences, to optimize the number of work displayed. For contemporary viewers this kind of display seems ostentatious verging on sacrilegious, because appreciation of any single work is compromised, however the configuration in this exhibition creates an unexpected power dynamic that resonates with Gangloff’s subjects. The viewer is frustrated by the crowding of Gangloff’s paintings, each of which is surrounded by selections from the Kresge collection, as well as the fact that several are hung as high as twenty feet, well above conventional eye-level. To counter the awkward angle and unsteady stance necessary to see the highest paintings, one would ideally like to sit, but the furniture is clearly not included for the viewers’ use, quite the contrary, one might unwittingly back into them. Juxtaposed with paintings from the Kresge collection’s early modern and modern portraits, the implicit message is that Gangloff’s subjects are the contemporary heirs of the ruddy aristocrats, rococo damsels, and willfully gaunt wives, whose likenesses surround them. Often in various states of undress, Gangloff’s model-friends are not exhibitionists, they simply do not care that we are present. Edgar Degas’ bathers don’t acknowledge us either, but that’s because they’re actually busy. It’s difficult to imagine any of Gangloff’s subjects doing much of anything useful. Mr. Hernandez, reading in the tub (Freelancer: Mikey Hernandez), is clearly between jobs. The male subject in Afternoon Shower, is just starting his day, and Ms. Vanderbeek (Sara Vanderbeek in her bath closet), does not seem pressed for time. The artist subtly implies that these are trust fund babies who are slumming it. Bath closet, for example, sounds so much more refined than bathroom (like davenport compared to couch). One might be tempted to regard the whole lot as nothing more than a bunch of shiftless millennials, who binge drink, sleep until noon, and then spend the rest of the day lounging around in their underpants, but not quite. Her subjects seem sophisticated and intelligent, in spite of their efforts to appear otherwise. If Gangloff’s models were up late, it’s probably because they were reading. After seeing the exhibit, I was reminded of Mary Cassatt’s distracted, fidgety model for Little Girl in a Blue Armchair (1873). As with Gangloff’s subjects, Cassatt’s choice of details like the trendy Scottish-inspired clothing, purebred lapdog, and matching upholstered furniture, indicate that this is a little girl of privilege. Cassatt knows that this indulged child will outgrow her insolence, and Gangloff understands this about her models as well. These aloof subjects will soon become those genteel ladies and gentlemen who notice you are alone at a social event, and graciously engage you in conversation. Not only Schiele, but I also see echoes of Suzanne Valadon in Gangloff’s work. Partly in the repose of her figures and also in the palette. I was wondering about the size of these canvasses. Definitely. I thought of Valadon too, particularly “Blue Room.” These are all large canvases, in some cases the figures are just slightly larger than life-sized.